The Wiggly Worm is headline news! March has seen The Wiggly Jiggly Worm make his first newspaper appearance. 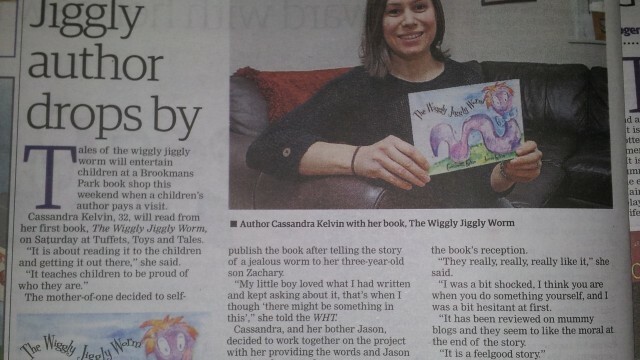 Author Cassandra Kelvin, featured in the Welwyn and Hatfield Times on March 19th 2014, was thrilled to have the opportunity to talk about the process of self-publishing and the wonderful response to her first title The Wiggly Jiggly Worm. Wiggly House has had a very busy month, kicking off with World Book Day on March 6th and a visit to Moss Hall Infant School. The children loved hearing the story of The Wiggly Jiggly Worm, especially as they had been learning all about ‘Mini Beasts’. On 22nd March Wiggly House visited the children’s bookshop Tuffet’s Toys & Tales in Brookmans Park for storytelling, followed by some beautiful colouring of The Wiggly Jiggly Worm which was then displayed on the wall. With two fayres to end the month of March, Wiggly House is now looking forward to a busy April with visits to nursery schools, The London Book Fair, and independent bookstore Big Green Bookshop. Wiggly House was thrilled to be invited onto Radio Verulam’s Arts Show on Sunday 23rd February. Chatting to presenter Alexander Bermange about how The Wiggly Jiggly Worm was created, from a story on a page to a fully illustrated picture book, author Cassandra Kelvin had a great time in the studio. During the show author of the Princess Poppy series, Janey Louise Jones joined them on the telephone for an interesting discussion about self-publishing and the process of writing. Click below to listen to a few minutes of the interview. 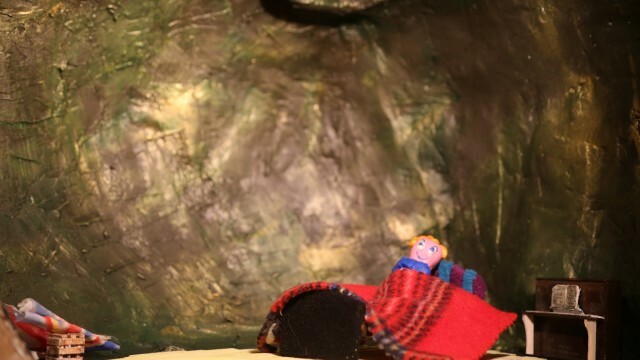 Wiggly House are proud to present a short animation preview of The Wiggly Jiggly Worm. If you enjoyed the book then watch our favourite worm come to life. You can view it here. Watch this space for the next animation adventure! Wiggly House has had a very busy week visiting Gilah Nursery School and JAM Baby and Toddler Group. It is wonderful to see all the children enjoying and engaging with the story and to be receiving such lovely reviews. The Wiggly Jiggly Worm is receiving 5 star reviews on Amazon. The latest is from Charlie Plunkett, author of The True Diaries series of books. ‘This book is beautifully illustrated and rhymes in a way that makes it easy to read to your child.’ You can read the full review, along with all the others on Amazon.